* Heading back in the archives this week for a story of remote trekking and welcoming home stays in Turkey. I’ve got a theory about visiting new places: two feet are best. The best way to learn about local culture and meet local people is to tackle a walking trail. So while city slickers were stroking their chins ponderously over art installations in Istanbul, last year’s European Capital of Culture, I chose a trekking trip to a rural backwater to connect with the traditional Turkish culture. The St Paul Trail [pictured above], a three-section, long-distance footpath between Aspendos (or Perge) near Antalya in the south and Yalvac in central Turkey, is the country’s newest walking – a total of 500km, or 24-day, of serious trekking. I say new. It was established around 2005, but is still very much in its infancy in terms of local infrastructure and visitor numbers. Some sections are remote and physically demanding. A volunteer team of waymarkers marked out the trail last summer to encourage visitors and bring much-needed tourism revenue to the remote village communities. I opted to walk a week of day sections along the more popular southeastern leg, running 120km south from Adada to Aspendos, transferring from trailheads each evening to local accommodation. While independent travel is possible, my trip was booked through a local tour agency and included jeep transfers, a walking guide and accommodation in simple but friendly homestays along the way. I join the trail amongst the Roman ruins of Adada, where the fragments of the settlement are blissfully lost in time. As I clamber over the ruined pillars, I am alone, silent amongst the ghosts of an ancient civilisation. The path down to the village of Sagrak is the first truly iconic stretch of the trail, following the old Roman road through a rocky scrubland of gorse bushes and wild garlicky chives. I spend the afternoon descending over huge Roman slabs to arrive at the tranquil village in time for the afternoon call to prayer and my first saccharine hit of sweat Turkish tea, served up by a group of old men from the mosque. We sit in the courtyard, all smiles and gestures, before a jeep ride to the Kasimlar for the night. The house of Abdul Kokdogan and his wife, Serpil, is one of the best-established homestays on the southeastern section of the trail. It’s also a benchmark for how the burgeoning infrastructure of the St. Paul Trail could develop over the years to come. Most importantly, the well-connected family has obtained the only alcohol licence in what is a deeply conservative rural community, ensuring a sturdy kitchen cupboard is always kept well stocked with bottles of local, very drinkable Efes Pilsner for new-arrival walkers. I bed down that night on a fold-down sofa in the living room with lots of thick blankets for those chilly village nights. A breakfast of bread, cheese and homemade jam, washed down with glasses of strong, sweat tea, is served the next morning in the same room, while a wood-burning stove provides a cosy glow. “We’ve made friends around the world,” smiles Abdul over breakfast. As I prepare to leave, the morning call to prayer echoes off the mountains, neighbours call by to chat and their spiky-haired teenage son animatedly describes his hopes for an influx of good-looking female travellers on the new trail. I drain my tea, shake hands with the family and prepare to hit the trail. “I’ll be back to see how the route develops,” I promise. Their smiles are genuine, not forced. The next day walk from Kasimlar to Kesme starts from the village graveyard and climbs moderately to the Belsarnig Pass, where the old Roman well marks the summit. The going is good and I weave in and out of the waymarked path to dip under the shade of pine trees for water breaks. The snow-capped peak of Tota mountain soars above the climbing path, while larks, cuckoo and nightingales encourage me onwards. As I approach the pass, moving into greener pasture, a herd of hungry cows offer a nonchalant greeting. I can hear the cries of a local shepherd in distance. He’s telling us, explains my guide Deniz, he knows we’re coming and will try to keep his wolf-like dog under control. “Just remember,” warns Deniz, suddenly serious. We transfer on from Kesme at dusk, avoiding a night of camping in favour of another family-run pension on trail at Caltepe. I’ve got a long day ahead, heading south on the trail back towards Antalya but the warmth of the welcome by Erdinc Barca at his simple but atmospheric guesthouse instantly puts me at ease. We sit on the terrace, picking out the stars over the mountains and sipping sugar-thick tea as Erdinc offers his advice for tomorrow’s walk. A breakfast of fruit, bread and honey sets me on my way at dawn, following another old Roman road past chameleon rock formations and dipping into the shade of olive trees en route. The landscape on this leg had a more ethereal, twilight atmosphere with mossy, volcanic rock-carved grottos. The final leg takes me south via the Roman bridge over the Kaprulu Canyon to the well-preserved ruins of Aspendos and the dusty, sun-baked southeastern trailhead at the nearby aqueduct. Strolling through the well preserved ruins makes for a suitably atmospheric end to the hike but after the freeze-frame pace of village life, the transition back to the real world is an uneasy one. A women waves a 5€ note for a camel ride, a local man rubs his hands behind a counter covered with tepid cans of soft drink and the jobsworth ticket officer grumbles about me taking pictures. I had to fight a mad urge to turn on my heels and start walking again, exploring another section of the trail, or embarking on one of the more ambitious sections. After all, there was plenty more trail to explore. * This story was first published in RedHanded Magazine in 2011. Liked this? 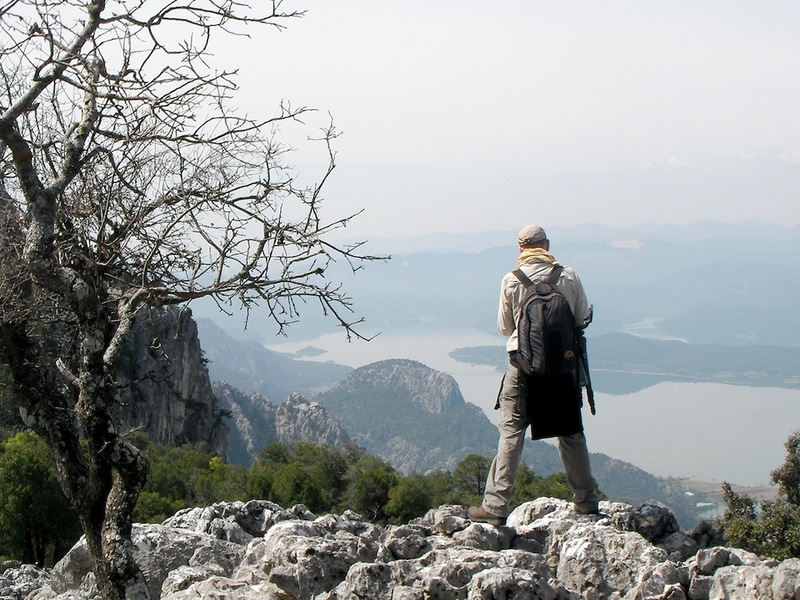 Try Hiking Remote Trails in Turkey.